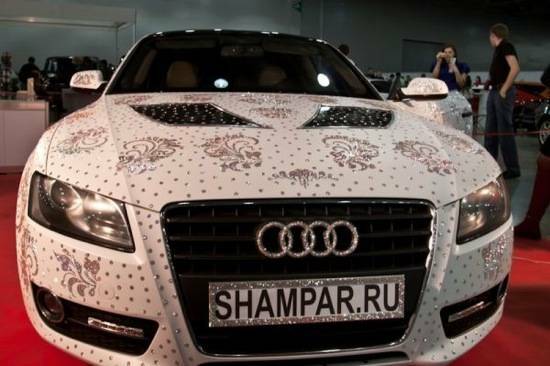 This year’s Moscow Tuning Show at the international exhibition center Crocus Expo brought together some of the world’s most impressive Russian and foreign tuned vehicles; but one stood out from the crowd with the brilliant sparkle of 450,000 Swarovski crystals. Though the show was rampant with impressively modified autos, Russian tuning company Shampar brought one vehicle that wound up stealing the spotlight. They gave one Audi a magnificent makeover by embedding 450,000 gleaming Swarovski crystals on its surface, as well as on the exterior and interior accents, which took the company about 1,440 hours to painstakingly apply and cost about 6,000,000 rubles, or $214,415.